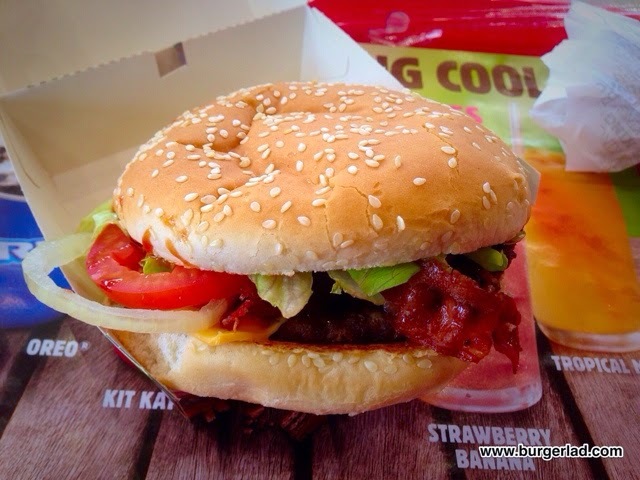 Burger King Summer BBQ Whopper - Price, Review, Calories & More! 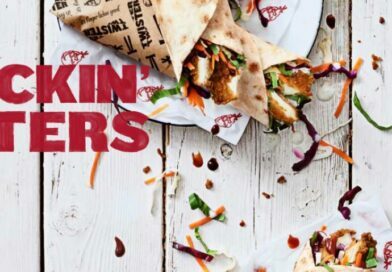 Summer’s here, so come on over to our place and get your chops around our Summer BBQ Whopper®. 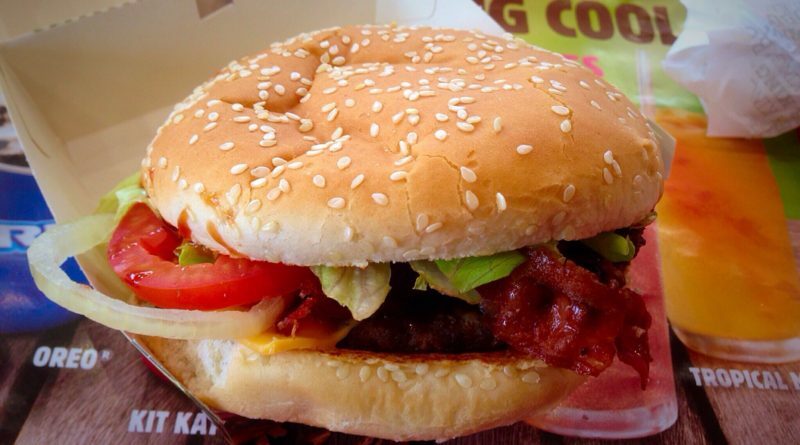 It’s flame-grilled, 100% beef patty topped with lettuce, tomato, onion, sweet BBQ sauce, crispy bacon and cheese. 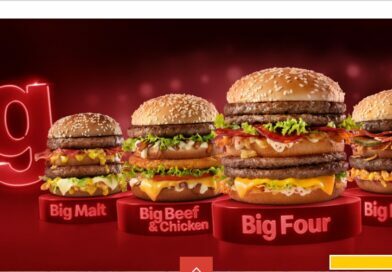 Price: £4.79 for the burger only. 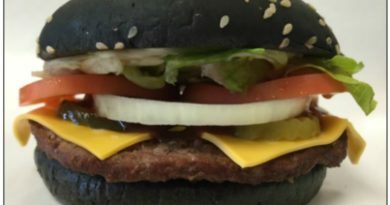 This is a burger that has been around for a while, and in fact is due to be replaced next week by a new limited line-up, as Burger Lad® reported here. I do apologise for not getting around to this sooner. There’s not much excuse. Too many burgers, just one belly I suppose, but I do beg everybody’s forgiveness. It may well be back in future summers, in some form or other, so it is still very worthwhile reviewing. 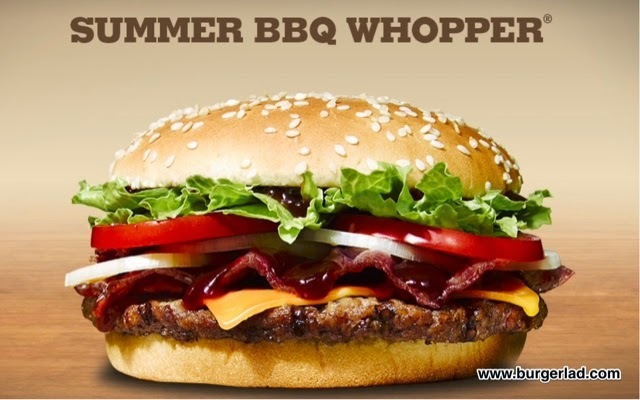 The Summer BBQ Whopper seems to differ from the regular Whopper with the inclusion of bacon and cheese (which are available on the aptly named Whopper Bacon & Cheese), and Burger King’s BBQ sauce which, as we know from the Rodeo, is really rather good. Like the Whopper, this includes tomato. From the photo on the summer range marketing materials, the tomato slices look very prominent. As you know, I’m not a great fan of fresh tomato on burgers, so that may have served to put me off all this while. 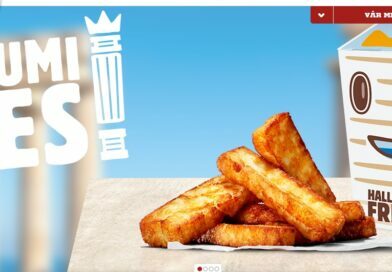 However, Burger Lad® asked very nicely so it’s off to BK I go. At the start it was a bit annoying, frankly. The staff seemed to make it look busier than it actually was. Most frustratingly, the one lady at the tills seemed intent on clearing all the existing orders (about 4 or 5 receipts laid out on the counter) before making eye contact to take new orders. So that wasted a bit of time. Anyway, I finally put in my order, waited a short while, then took it back to my table. The BBQ smell was present as I walked, with its sweet tones, and my mouth was watering before I sat down. Opening the box and the presentation looked neat. The burger was tucked in a paper wrap with bacon, onion and tomato poking tantalisingly out. Well, bacon and onion poking tantalising out. Tomato was crashing the party. 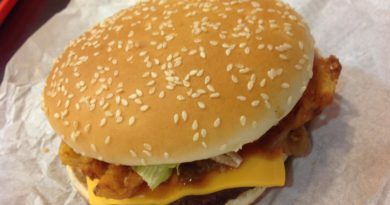 All Whoppers have quite a girth and this was no exception. 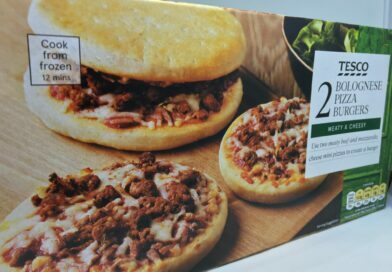 It’s a substantial offering for £4.79. I duly got the photos before discarding the tomato. I dislike waste and should have asked for the tomato to be left out, but I was perplexed with the serving delay and forgot. With the first bite I got the double taste whammy I was expecting. 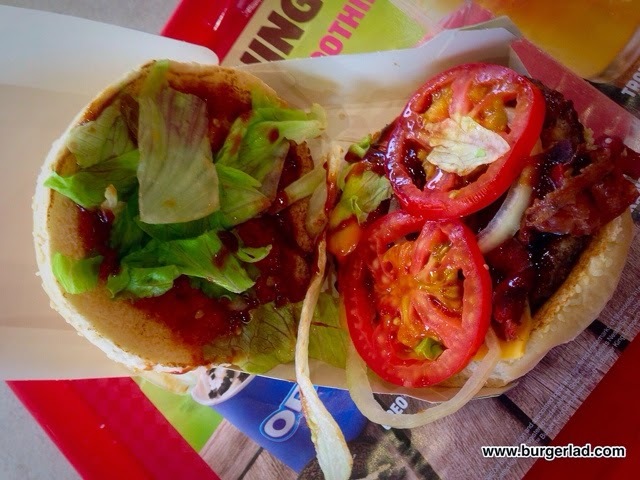 The trademark grilled beef taste of BK’s cooking, and the sweet (very sweet) barbeque sauce hit. All good, so far. As the two large slices of tomato stared up at me from the tray, I got stuck in further. Lettuce, cheese, onion. All in here and all rather generous. But my taste buds had to hunt quite hard for them. Strangely enough, although I’m assuming it is the same stuff, the barbeque sauce didn’t quite announce itself as clearly as it did on the Long Rodeo. Perhaps because summer is nearly over, and it’s getting tired. Anyway the bacon did. 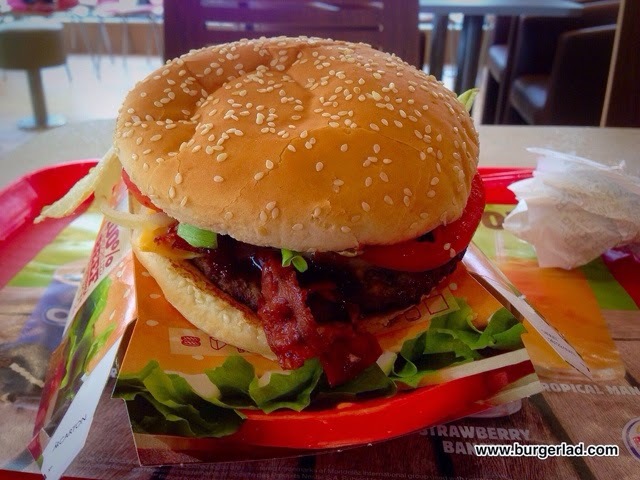 Bacon is probably one of the all-time great burger toppings. It tends to enhance the beef without taking over completely. A word for the Whopper bun too. 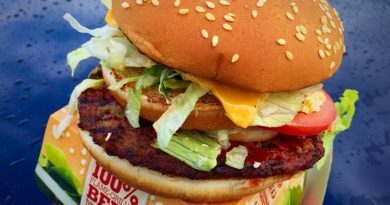 It looks a bit pale, ironically for a summer special, but it is a substantial size for the patty and its toppings, holds together just fine and does the job asked of it. I’d probably darken it a bit, but that’s largely aesthetic. It tastes fine. We’ll be back next Tuesday…! 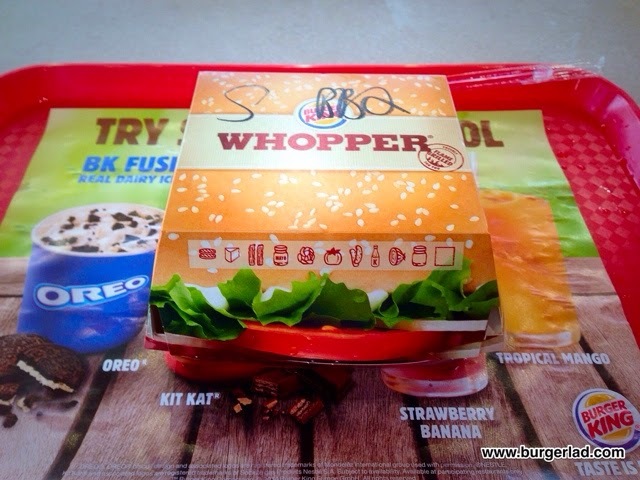 So, the Summer BBQ Whopper from Burger King, just in time for the end of summer and BK’s new offerings next week. Goodbye summer. I’m off to do my Christmas shopping now.